The aim of this plug-in is to provide a wide variety of shaping options. The plug-in is able to emulate the main features of two types of limiter: VCA-limiters, which is a modern type of analog limiter, and Opto-limiters which are vintage optical limiters. Keep in mind, however, that PSP Twin-L’s limiting algorithms are not intended to emulate any specific hardware but rather to bring the capabilities of both types into a versatile plug-in. It’s also worth mentioning that the PSP Twin-L is part of PSP's series Zero Latency Processing plug-ins; no additional latency is critical in many situations such as live monitoring and managing automation. Two modes: Vintage Opto and modern VCA. Limit / Thru switch Engages (Limit) or disengages (Thru) plugin's processing. When in Thru mode the meter is not lit in order to give you a better indication of the plugin's state. Soft / Hard switch: Enables or disables soft knee limiting mode. Ceiling knob: Sets the limiting ceiling level above which the compression ratio is infinity:1. Possibility of switching between external (if applicable) and internal side chain signals. HPF trim knob: Controls the frequency of the side chain high pass filter. Monit /Proc switch: Switches between normal processing and monitoring the content of the side chain signal, its high pass filtering, and linking. Blend knob controls the mix between the input signal and the processed signal to retain natural peak response while maintaining the density of the limited track. 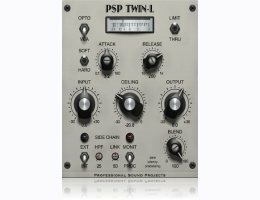 You may download a 30 day trial demo of the PSP Twin-L plug-in HERE!